A very experienced compere , enjoys banter and a prolific writer of new material so you never get the same old stuff. 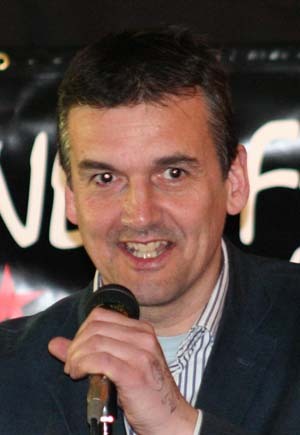 Has been the regular or resident compere at a number of venues in recent years including - Stamford Arts Centre, Leicester Phoenix Arts Centre, Market Harborough Theatre Lounge, The Looking Glass in Leicester, Richard Attenborough Arts Centre in Leicester, Cox’s Yard Stratford-Upon-Avon, Newark Palace Theatre, Bosworth Studio Theatre in Desford. venues including – Bollington Arts Centre, Bridlington Spa, Pocklington Arts Centre. Bury Met, Norwich Playhouse, Darlington Arts Centre, Derby Assembly Rooms, Maidenhead Norden Farm Arts, Dartmouth Flavel, Torrington Plough Arts, Havant Arts , Uppingham Theatre, Finchley Arts Depot, and more..
Also co-writing a couple of sitcoms with Patrick Monahan and writing a screenplay about Noel Coward , among other writing projects currently underway . A driver, based in NW Leics, so very handy for most parts of the country.